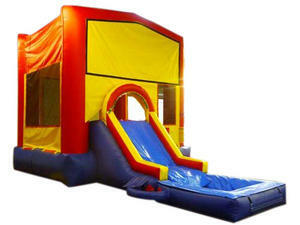 The Modular(water adaptable) combo has a bounce area, slide, inside basketball hoop and pool. Comes with water sprayer. Customer must supply hose. You can add your choice of themed banner to the front of this unit. You will see your choice of banners in the shopping cart. If you do not see an art banner that you like, please call our office. We have many more to choose from.